GOT stuck in how to run security camera wires or cables outside or in your home? You’ll get a step-by-step guide here to show you how to install outdoor & indoor security camera wiring. Even you are the first time to run security camera cabling, you can install your security camera wiring through attics/walls, for your front/back door, reception room, front/back yard, shop floor, bedroom, garage, warehouse, basement, parking lot, farm, entrance, even upstairs, etc. quickly and easily. Big Hint: If you choose battery powered security cameras, you can just place the cameras outdoors or indoors without worrying about the wiring and cabling. When you are about to run security camera wires outside or inside, you should prepare the below necessary items. You can take a look at the below security camera wire diagram before running cables. Note: Some detailed tools are not mentioned here. You can see the best tools for drilling holes here. If you need to run underground wires for security cameras to monitor your garden, driveway, etc. PVC/metal conduits are necessary. Installing security camera wires inside of your house, such as the attic, soffit, siding, etc. is much easier than the outside job. You can follow this security camera wire installation guide to hide or run the wires in your house. Step 1. Design the central surveillance hub before snaking security camera cabling. The place where you place your NVR/DVR — the central surveillance hub —in your house determines the route of wiring. Placing your NVR/DVR smartly in your house can help you get rid of messy wiring disaster. The place should be easy to access so that you can hardwire your security camera comfortably from anywhere in your house. 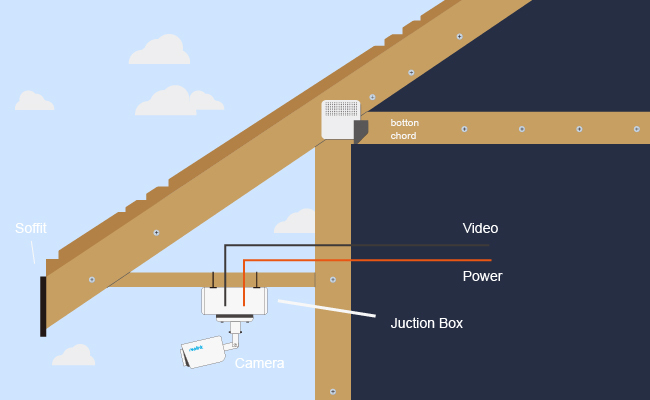 Attics and your Internet router are ideal places to place your NVR/DVR. Note: You can get helpful tips here to place your security cameras (systems). Step 2. Turn off the power when running security camera wires, which can protect your personal safety and avoid damaging your devices. Step 3. Drill a hole in the position where the outlet will be (for wireless security camera & analog security cameras), and use a straightened metal coat hanger to feel inside the wall for any unforeseen obstructions. Drilling is undoubtedly one of the best and easiest ways to run security camera wires through walls, soffit, vinyl siding, etc. If you run a Cat 5/6 Ethernet cable of your security camera, you can just drill a hole to run the Ethernet cable from the camera to your home router or NVR. If the distance between your camera and router/NVR is too far away, you can add a PoE injector. Step 4. 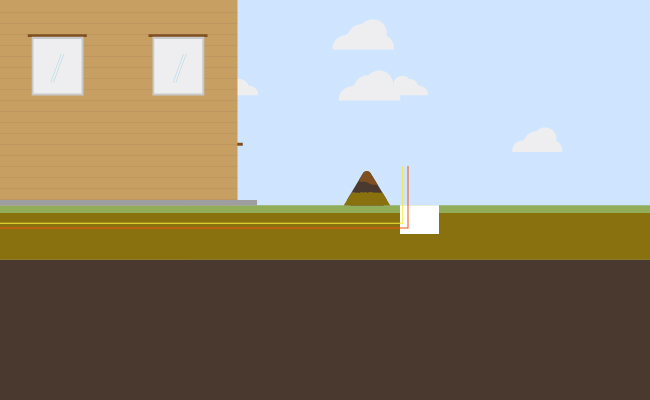 The gap/hole should be larger than the maximum amount of wires you expect to ever run. Allow a few feet of extra wire inside for both termination, and future reorganization if needed. Labeling the ends of the cables will help you figure out which security camera works with which cable. Step 5. Go to where you want to install your security cameras, such as attic, soffit, basement or crawlspace, and drill a hole in the top or bottom wall plate in the same wall cavity. Step 6. Attach the wires with the fish tape to fish your security camera wires. Step 7. Run security camera wires or cables to the destination (you may need a partner to feed the wires for you). Remember to use the security camera wire protection cover or conduit to protect the cables. Hope the above step-by-step guide has answered the questions like How to run home security camera wires though attic/wall? How to run security cameras for my two-story house? If you don’t want the security camera wires to ruin your current house decor, you can try the below tips to hide the cabling smartly. When you drill a hole to run the IP camera wiring, like wiring cameras through ceiling, you can hide the security camera cable with the wire guards. Put the cable into the guard, and attach the guard to the wall inside of your home. So no wires are plain in sight. A DIY lover posted a video on YouTube, showing his security camera installation guide inside his house. (He hide the security camera wires under the desk. What a smart idea!) You can check the video below. When you need to install outdoor security camera wiring, you can get the detailed guide below to run security camera wire outside. When you need to mount IP cameras outdoors, the outdoor security camera cabling job is the key process. You can check the guide to wire your security cameras from your house to a far-away property, like your driveway, isolated garage, front garden, etc. and the steps to install CCTV camera cables from inside of your house to the outside, such as your front porch. When running security camera wires outside (especially the long-distance job), you can bury the cables to protect the wires from being tempered. Step 1. Plan the security camera wire route. 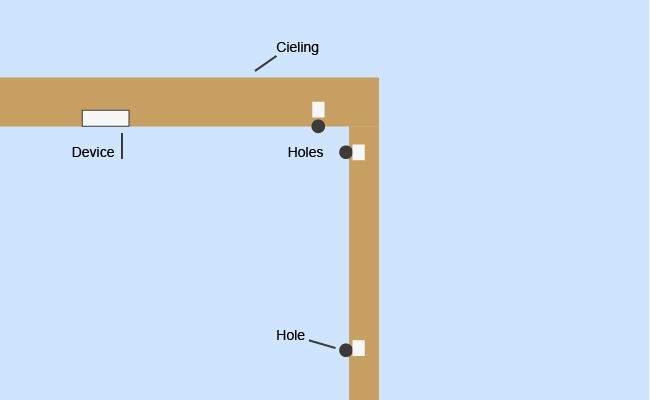 Find a rather short and easy route to bury your conduits so that the burial job could be easier. Step 2. You need to use the wire guard, PVC or metal conduits to protect the home security camera wires from tampering (both human and natural – squirrels, birds etc). Step 4. Mark the place where you want to cut the hole. Step 5. Drill a hole to run security camera wires from your house. Once the hole is cut in the wall, insert a drill bit to drill a hole so that you can run wires through it. Remember to use a right angle drill with hole saw bits for boring large holes. Keep the holes centered on the studs. 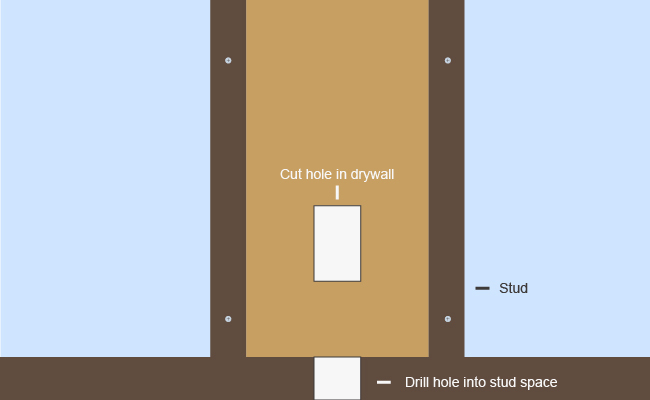 Drilling a hole in the wall is much easier than drilling in the floor. All you need to do is to drill slowly and not press too hard. Stop when you feel the drill penetrate the wall. Step 6. Bury electrical wires/network cables. Before you need to run wires for your security cameras, you need to bury the PVC conduit at least 18 inches, while 6 inches for metal conduit according to the National Electric Code (NEC). Step 7. Now holes are already done. Running wires comes next. Fishing the wires is quite easy when you attach them with a fish tape or a pull wire. Wrap the bare wire through the fish tape eye and twist the end of the wire around itself. Place the electrical tape over the end of the fish tape eye and wire. Now you are ready for pulling wires. Step 8. Pull security camera wires. With one person standing to feed the wires, pull evenly on all of the wires. Keep the wires untangled. As for the person pulling the wires on the other end, pull the wires slowly, such as in 2 to 3 foot intervals. Pulling too fast would nick the wires and catch your partner’s fingers. You can watch the bellow video to get the step-by-step installation instruction on how to install a dome security camera. 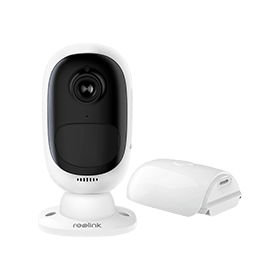 You can also read this post to get more details on how to install security cameras (written by Amanda, Reolink senior tech editor, who is really addicted to DIY projects). Some of OPs asked questions on forums, like “How to run cables for your outdoor PoE security cameras, or how to install power wires for outdoor wireless security cameras? Hope the above detailed guideline would be handy. If you just mount a security camera to the brick outside of your house, like running security camera wires to the hard board, the setup process is quite simple. Step 1. Decide the where the camera is placed. Step 2. Drill a hole from the position of the camera to the router or the NVR (for PoE camera cabling). For outdoor wireless security cameras, you just need to drill the hole to run power cables for them. Step 3. As mentioned above, you can hide the security camera wires with the wire guards. When you need to bury your security camera wires, read the underground wire installation notes first to avoid any possible troubles in the future. Security camera wiring job is the key process of installing security cameras. There are still several minor steps to finish the whole installation job. You can check the below steps to set up wire-free, PoE, wireless & analog security cameras. Wire-free security cameras are powered by batteries and transmit the data via WiFi, which makes this type of security camera completely wireless from the top to the bottom. Here we take Reolink Argus® 2 battery powered security camera as typical example. Step 1. Download the Reolink App from the App Store (for iPhone), or Google Play (for Android smartphones). Step 2. Install the battery to the camera, and then you are gonna hear the verbal instruction to help you set up the camera. Step 3. Pick a name and set up the pass word for the camera. If you want to get a security camera without drilling or installation job, try this one. PoE security cameras only rely on a Cat 5/6 Ethernet cable to realize both data and power transmission, which makes this type of cameras the easiest wired security camera type. Here we take RLC-410 PoE IP security camera to show you the overall setup process. Step 1. Install the camera to the position you want. Step 2. Run the Ethernet cable from the camera to the router or the Reolink NVR. Step 3. Download and launch the Reolink app on your mobile phones. When your smartphone and the camera are in the same network, simply say in LAN, the camera will be automatically added to your phone. When your mobile phone and the camera are in different network (WAN), you can scan the QR code on the camera or enter the UID of the camera for remote live view. Wireless security cameras depend on WiFi signal to transmit data, while requiring a cable to get power. You can check the below setup guide to get the complete installation procedure for wireless security cameras (here we take RLC-422W as an example). Step 1. Mount the camera to a position that is close to a power outlet. If the power outlet is a little bit far away, you can run the power cable for your wireless security cameras. Step 2. Plug the camera to the power outlet. You also need to connect the camera to the router with the network cable for the initial setup. You can remove the network wire after that. Step 3. Download and launch the Reolink App on your iPhone or Android mobile phones. The camera will be automatically added to your smartphone when in LAN. Scan the QR code or enter the UID of the camera to access live stream when in WAN. Analog security cameras need to connect to the DVR to function. In other words, this type of security cameras cannot work standalone. Analog security cameras would be more challenging to install compared with the IP camera type, since the cameras need cables to get power, and also need to connect to the DVR with the coaxial wires. You can check the below analog security camera connection guide to get more details. Step 1. Decide the position of the DVR and the mounting position of your analog CCTV cameras. The placement for the DVR should be easy close to the router and the power outlet. Step 2. Connect the camera to the DVR with the coaxial cable. And also plug the camera to the outlet to get power. Step 3. Connect the camera to the router so that you can get remote live streaming. You can also connect the DVR to the monitor with the HDMI cable to get local live viewing. You can mount security cameras to the soffit, one or two story house, stucco wall, vinyl siding, etc. with the above step-by-step guides above. Besides the above detailed step-by-step guide to run security camera wires inside and outside, you can learn more details about video security camera wire setup in the below part. Some readers sent emails to us, asking about more details on running wires for security cameras, such as security camera wire diagram, splicing, types, etc. We decide to add a part that aims to solve our readers’ issues on security camera & system wires. You are invited to add your own insights in the comment below! We will feature your opinions in this article! A 1. One of the best ways to hide security cameras outside is running burial wires. You can try the below steps to hide the wires for your security cameras. Step 1. 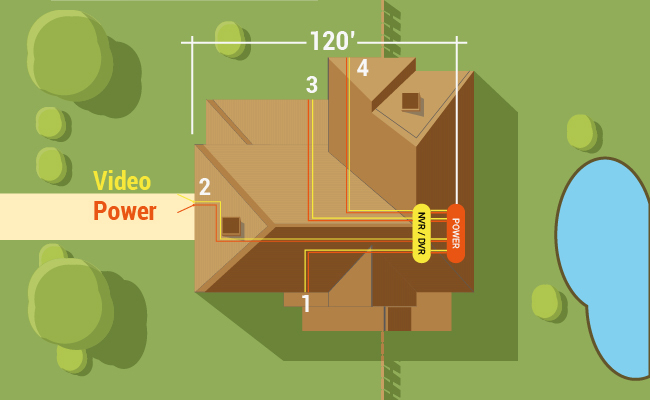 Plan the wring route for running wires for your IP camera outdoors. Make the router as short as possible, which would make the burial job easier. Step 2. Get the pipes ready for the wiring, such as metal conduit pipe, PVC, etc. Step 3. Mark the points where you’ll need to drill holes. Step 4. Bury the pipes. According to the National Electric Code, the PVC conduit needs to be buried at least 18 inches, for metal pipes, 6 inches. Step 5. It’s time to run the security camera cables. Use a fish tape to pull your wires. Now you can protect your security camera wires and hide them from plain sight. When you need to hide security camera wires insides, you can try the below solutions. Solution 1. Paint the wires. You can staple the wires to the corner and the paint over them using the same color as the walls. Solution 2. Run the security camera wires behind the baseboard in your room. A 2: Well, it depends on the distance your security cameras can receive Internet signal from your router. Usually, the PoE security cameras can receive Internet signal from 330 feet, while wireless security cameras can receive the signal from 300 feet. After you have been routing the security cameras wires outside, you can add a security camera wire cage to protect your camera from being tempered or stolen by the thieves. Can security camera wire be spliced? A 3: Yes, security camera wire splicing would be easy with the below detailed installation guide. Step 1. Use your knife or cable cutter to split the 2 insulated wires, and remove half of an inch of the insulation from the end of the wires. Be careful not to injure your fingers when cutting the wires. Step 2. Splice the cables together (with wire nuts), via twisting the exposed copper ends. Make sure that you twist the positive from one wire to the other (same as the negative cable). Step 3. Splice the 2 power cables together, using the security camera wire connectors, and then insert the exposed copper wire from the positive conductor into one end of the connector. Do the same thing for the other positive wire and the 2 negative wires. Don’t forget to use a security camera gauge to check the amount of the electric current the wire can carry to avoid the possible circuitry burnout. A 2: When running wires for your security cameras, implementing the suitable cable type will save you immense amounts of headache later and calls to tech support to solve the issues that should not have happened. Security camera wire types usually include 3 main kinds: Cat 5/6 Ethernet cables, Siamese cables and plug-and-play cables. Cat 5/6 Ethernet cables — this type of security camera wires transmits the video/image data and power via a single cable. The Cat 5/6 cables can carry the video signal up to 1,500 feet. This type of cables is used for PoE IP cameras, which offers you an easier solution to run wires, compared with the traditional hardwired CCTV surveillance cameras. 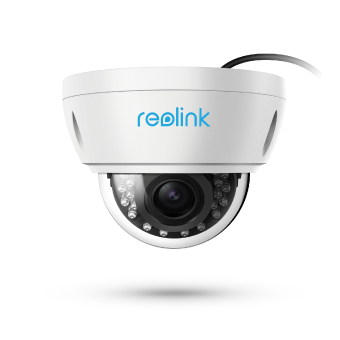 If you are interested in Cat 5/6 IP security cameras, you can read this post written by Olivia, Reolink’s tech editor, who always loves to share trendy and useful home security camera information with her readers. Siamese cables — this kind of security camera wires usually includes 2 types: RG59 and 18/2 wires. RG59 cables are a specific coaxial wire used to connect the cameras to the DVR. 18/2 wires are 2 separate 18-gauge wires used to transmit power from the power supply to the cameras. Plug-and-play wires — this type of security camera cabling has the connectors for both video and power supply. The security camera wire data transmission length is available in 25, 50, 100 & 150 feet. The downside of the PnP security camera wires is that they cannot offer high-quality video and power transmission, compared with the above 2 types. And the cables are not able to transmit the signal data any further than 150ft. A 5: There are 2 main types of security camera wire guards. One of the types looks like a cage, which typically is used for protecting the security camera from being tempered. The other one is typically with long-strip shape, and is used for protecting security camera wiring from rain, shine, etc. Please check the below steps to install the wire guards for protecting your security camera wiring. Step 1. Tie the security camera wires together with a rubber ring. Step 2. Use the wire guard to fix the wire bunch. Step 3. Attach thee wire guard with several screws. If you have any questions or ideas on “How to Install Security Camera Wires”, please leave them in the comment below! We will feature your questions and insights in this article! This entry was posted in How-to Guide and tagged hide cables, installation, run camera cables, wiring. Very helpful article! I have been searching for something like this long time. Giving us strait forward the knowledge we need is making us free. Hello Val, we are so glad this article helps you. You can share this post with your friends so that more people can get useful information in this post! Is there a detailed guide on how to install the wire guards? I can’t seem to figure out how they go onto the wires. Hello Robert, first you’ll need to buy the wire guards with bigger size than your security camera wires. Fish the security camera wire into the guard and all is done. Good article but no mention is made of how to hide the cables with a junction box or similar. My first camera installation had me left with a wall full of messy cables. I’ve now ordered a junction box but I’ve had to guess which size might be suitable for the ethernet, reset and power loom bundle. I have opted for self sealing grommets but I’m unsure as to how all three cables will work and wether I’ll get an adequate weatherproof seal. Many question, not so many answers!